Richard Carlson, author of a number of self-help books, talks about how gratitude comforted him after the loss of a close friend. 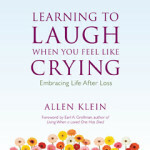 In You Can Be Happy No Matter What, Carlson writes about how gratitude comforted him after the loss of a close friend. When we access our healthy functioning, emotional pain has a different feeling to it—it is still painful, but it includes genuine gratitude for having known the person we have lost. This worked beautifully in my own life, when one of my best friends was tragically killed by a drunk driver on his way to be in my wedding. Rather than think about him sadly, I was able to clear my mind and feel tremendous gratitude for having known such a wonderful friend. Instead of feeling sorry for myself or for my friend’s family, fond memories began to surface from our past together. I was not overwhelmed by my sad feelings and was able to function. 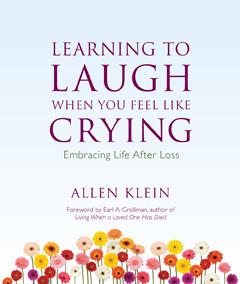 P.S.- In my book, Learning to Laugh When You Feel Like Crying (Goodman Beck, 2011), I suggest a simple way to move towards being grateful after a loss: Tomorrow morning, before you get out of bed, think of at least one thing that you are thankful for. And then, when you get out of bed, start writing down all the wonderful things in your life. Those are just of few little gratitudes that can keep you afloat while you are in a sea of grief. But you might also want to note some of the bigger things for which you are grateful. that I actually will need to…HaHa). You certainly put a fresh spin on a subject that’s been written about for decades.